Frontier Tank Lines is made up of many dedicated and talented individuals, who come together on a daily basis to form one unbelievable team. A team that allows us to deliver on the fuels needs of each and every one of our customers with imbeccable and extraordinary service. Without them, Frontier would not be where it is today. 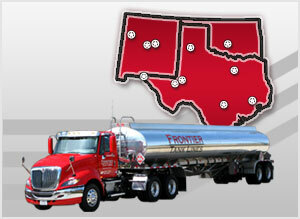 Our Management team provides the leadership that allows the Frontier Team to flourish. With decades of combined experience and expertise, Mike Collins, Brad Dawson, and Chris Weber are the driving force behind our success. With a keen eye for what lies ahead, and a solid foundation for the business, the leadership team at Frontier Tank Lines is forging an even greater success for tomorrow. From Fleet Fueling and Inventory Management, to Tanks and Transportation, and even Emergency Fuel Services, Frontier Tank Lines is always looking to expand in ways that continue to raise the bar. We are constantly expanding not only our services, but our reach. If there is a way we can help you, please let us know.